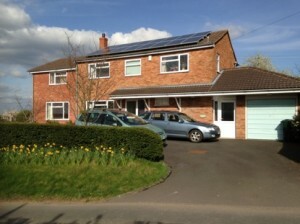 This is an unusual System for a Domestic property as it is over the 4kWp limit for the domestic tariff. But the energy Generation and Feed in Tariff income quickly prove its worth. The annual Generation is estimated to be 6,800.0 kWh and over the next 20 years will save 68 Tonnes of Co2. 100% of the annual electricity bill will be funded by the FIT scheme. The system Payback time is estimated at 7 years 2 months.